Sikkim is a north-eastern state of India and the hill town Gangtok is its capital. It has international borders on three sides... its north border is with Tibet (which is now part of China), west with Nepal and east with Bhutan. Only the southern border is with India and that is with the state of West Bengal, to be more specific with Darjeeling district. Almost the whole of Sikkim is in a hilly terrain surrounded by the Himalayan mountain range. The altitude across Sikkim varies widely and ranges from the lowest elevation of 280m (920ft) to the highest point of Kanchenjunga peak which lies at the border of Sikkim and Nepal and at an altitude of 8,586m (28,169ft). 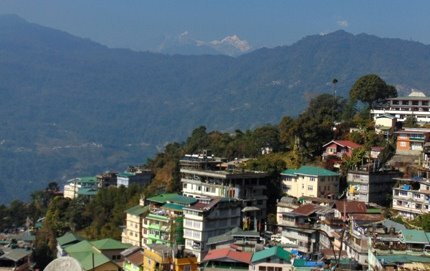 Altitude of the capital Gangtok is 5,410ft. Sikkim was an independent dynasty of Namgyal kingdom from the 1642 until 1975 when it eventually joined India and became its 22nd state. During the Namgyal monarchy it has been invaded by the bordering countries Nepal and Bhutan several times when it succumbed to these external forces, but regained its control through strange turn of events. Know about History of Sikkim. So what can you expect in Sikkim?.... fascinating views of Himalayas including Mount Kanchenjunga snow peaks, numerous mountain streams many of which eventually merge with river Teesta and river Rangeet, lovely river valleys and meadows, several high altitude lakes & hot springs, and even high altitude passes that connect the state with Tibet, Nepal and Bhutan. There are around 5,000 varieties of flowers including orchids (over 400 types) and rhododendrons that can be seen across the state of Sikkim. In the forests of Sikkim you can spot wildlife such as snow leopards, clouded leopards, red panda, Tibetan wolf, Asian black bear and other wildlife. In the upper reaches of Sikkim, yaks can be seen in plenty that are used mostly to carry loads for locals and trekkers. You can visit quaint & scenic mountain hamlets nestled in nature, many offbeat places, trek along nature & forest trails, and of course visit many other tourist attractions such as monasteries, museums, sanctuaries, handicraft centers, parks & gardens, zoo etc. And in places like Gangtok you can even enjoy activities such as rides on cable car (ropeway), paragliding etc and indulge in great shopping and nightlife including bars, pubs and casinos. There are numerous small mountain villages and well developed townships in Sikkim that are geared up with wide range of tourism offerings starting from very basic home stays at the remote villages to modern luxury resorts in developed towns. Extensive road network connects almost all parts of Sikkim although the road conditions in the higher reaches (mostly in north Sikkim) are often not good due to heavy snowing. Transportation system in Sikkim is excellent and comprises mainly of taxis (reserved and shared) and the vehicles are of various makes and sizes. There are also public bus services that operate between various points such as between Gangtok and Siliguri. The residents of Sikkim are mainly Nepalese, Lepchas and Bhutias. The Lepchas are actually the original residents of Sikkim, the rest are immigrants. There is a mountain village known as Dzongu Valley which is preserved exclusively for Lepchas where you can experience the original Lepcha lifestyle & culture apart from wonderful vistas of mountains, valley and plantations. Due to a mix of various ethnic communities in Sikkim, the food and cuisine of several origins have also seen fusion over the years and you can today commonly see food & beverages of one ethnic community is happily consumed by the others. Sikkim is a haven to savor many different kinds of authentic Nepali, Tibetan and Lepcha cuisine that can be rarely experienced elsewhere. While some of the tribal and specialty food can only be experienced in village homes and home stays, several restaurants in Gangtok and other parts of Sikkim also specialize in authentic Sikkimese food. While Momos & Thukpas are well known all across the north-eastern India, Sikkim goes a step beyond to have delicately preserved many of its ethnic cuisine including its specialty breads, cookies, snacks, meat based and vegetarian main courses that are both healthy & tasty, many different kinds of exotic pickles & condiments, and even uniquely homemade alcoholic as well as non-alcoholic beverages. Most Sikkimese can speak in Hindi and many in English, however there are 9 local languages belonging to Nepali, Lepcha and Bhutia community that are officially recognized by the state. Sikkim has a unique Ecclesiastical Department that coordinates the functioning of various monasteries, temples, churches, mosques, Gurudwaras and other shrines in the state. Sikkim does not have great fertile lands. But it has the largest production of large cardamoms in the whole of India. Some of the valuable crops produced here (that are also exported) includes tea, mandarin, cherry pepper, orange etc. A recent study shows that Sikkim's literacy rate is above 82%. Gangtok is one place which many tourists like to combine along with a visit to Darjeeling. In fact the combined trip of Darjeeling & Gangtok is a common recipe when people think about visiting this part of the country. This is mainly due to the proximity of the two places as well as easy transport access. And while in Gangtok, tourists visit several other places in Sikkim. P.S. The eBook on Darjeeling & Sikkim is a great resource to know both about Darjeeling and various destinations in Sikkim including the best places to visit, great sightseeing tours, day trips & safaris, top eateries of various categories & cuisine, shopping, nightlife and more. Since Sikkim shares its borders with China, Bhutan and Nepal, it is a restricted place for foreign nationals. So all foreigners (except Bhutanese) require a permit known as Inner Line Permit (ILP) to enter any part of Sikkim including Gangtok. Additionally the nationals of China, Pakistan and Myanmar need to get prior approval from Ministry of Home Affairs (Government of India, New Delhi) before they can apply for the Inner-Line Permit. Indians however do not need ILP. But there are several areas in Sikkim such as Tsomgo Lake, Nathula Pass, Lachung/ Yumthang Valley, Lachen/ Gurudongmar lake etc that are protected areas where everybody including Indians require a special permit known as Protected Area Permit to visit such places. And there are several other restrictions & exceptions, for example foreigners are not permitted to visit few places at all like Nathula and Gurudongmar Lake. Visit Sikkim Permits to know bout all the permits, who requires what kind of permit to visit a place in Sikkim, how to get such permits, validity period of permits etc. The whole of Sikkim is divided into 4 districts or zones - East, West, North and South. East Sikkim is head quartered at Gangtok (also the capital of the state), West Sikkim at Geyzing (also known as Gyalsing) with Pelling and Pemayangtse being the two places of central attractions, North Sikkim is head quartered at Mangan (Lachung with Yumthang Valley and Lachen with Gurudongmar Lake being the two main attractions of the zone) and South Sikkim at the religious & cultural hub Namchi. There are numerous magnificent places to visit in each of these zones. 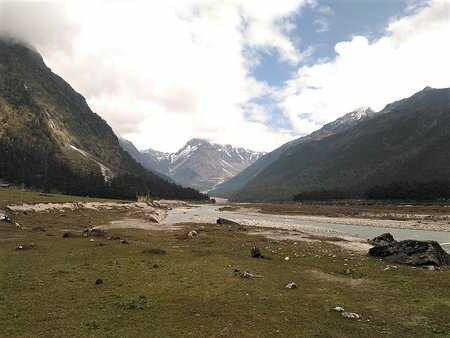 If you are the type who would like to go deeper and explore one part of Sikkim at a time and soak in the unique natural beauty, landscapes and lifestyle of each place separately, then you should dig deeper into each zone of Sikkim and know about the various destinations and attractions in each. Below are the four districts... go through the links to explore each zone of Sikkim. East Sikkim - It includes Gangtok (the capital town of Sikkim), Tsomgo Lake (a high altitude scenic lake), Baba Mandir (a temple built as a tribute to an ex-soldier of Indian Army known as Baba Harbhajan Singh), Nathula Pass (the high altitude pass that connects Sikkim with China), Zuluk (which is part of the historic silk route), many mountain hamlets, and more. West Sikkim - It includes Pelling (a popular tourist place known for its sweeping views of Kanchenjunga and nearby attractions such as holy lake, Asia's second highest suspension bridge, monastery etc), Kaluk & Rinchenpong (known for their natural beauty and views), Yuksom (the base for famous Dzongri and Goechala trek) and several other picturesque hamlets. South Sikkim - It includes Namchi (known as the cultural and religious hub of Sikkim with star attractions as Char Dham, Samdruptse Monastery etc), Ravangla (a sleepy town known for the scenic Buddha Park with its huge Buddha statue at the center), Borong (a paradise for bird watchers), the sprawling Temi Tea Garden (Sikkim's only tea estate but producing one of the finest tea leaves in the world) and several other quaint places. Sikkim has so many travelers destinations that it's impossible to cover them all in a single visit. And all have their unique charm and attractions. There are several ways you can plan to explore Sikkim... you can either choose to visit some of the most popular tourist destinations mentioned below, or go through my list of 10 best places in Sikkim, or alternative if you are a keen traveler seeking for deeper insights, then go through the Zones of Sikkim I have described above. If you are visiting Sikkim for the first time, Gangtok - the capital of Sikkim should be first in your travel agenda. Gangtok not only offers lovely views of Kanchenjunga and scenic views, it offers great attractions & activities such as parks & gardens, Buddhist monasteries & Hindu Temples, zoo with exotic Himalayan animals, art & craft centers, cable car rides etc as well as great opportunities for shopping, top class accommodations of all range, dining and nightlife. Gangtok is not only the most happening place in Sikkim, it also serves as the base to visit several other places in East as well as North Sikkim. Read Gangtok Tourism to unfold the secrets. The scenic glacial lake Tsomgo or Changu Lake is located at an altitude of 12,310ft. The lake surrounded by mountains freezes during the winter. 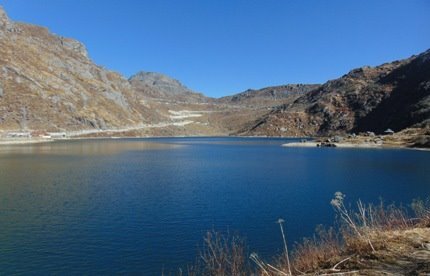 You take a half-day tour to the lake from Gangtok. There are many tour operators in Gangtok who offer tour packages. You can continue along the route and visit Baba Mandir (a temple built & revered on an Indian soldier who died here long back but his soul is believed to be still guarding the Indo-China border). Along with Tsomgo lake and Baba Mandir you can also combine Nathula Pass located at 14,140ft once forming the trade route with Tibet. 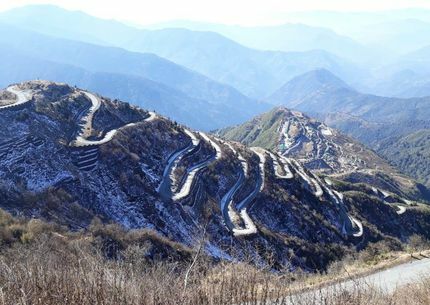 It now serves as a border pass with China. Combining Nathula will require a full day trip from Gangtok. From Gangtok, you can make an excellent trip to north Sikkim with an overnight stay (1 night 2 days) which includes the mountain village Lachung offering lovely views of mountains, the spectacular valley of flowers featuring varieties of rhododendrons in different colors known as Yumthang, and the snow covered Zero Point where the civilian road ends. Read Tour of Lachung & Yumthang to know what to expect and how to visit. Lachen is a small mountain village in north Sikkim and has developed into a base to visit Gurudongmar Lake which is one of the highest lakes in the world close to the Indo-China border. Another wonderful place here is Chopta Valley which lies between Lachen and Gurudongmar, and gets covered with flowers during spring and with snow during winter. Read Lachen & Gurudongmar tour for complete details. Pelling is a small hill town in western Sikkim offering spectacular views of the snow peaks of Kanchenjunga apart from many other attractions including old monasteries, lovely lakes & landscapes, waterfalls etc. There are also several nearby places offering wonderful drive through scenic landscapes and taking you to great attractions such as the second highest suspension bridge in Asia, indo-Nepal border village, first capital of Sikkim and lot more. Namchi is an excellent place for cultural and religious tourism located in South Sikkim. The place has been developed keeping in mind the devotees and those who are religious minded. But other than unparalleled experience of temples, monasteries and places of worships, Namchi also offers wonderful views of snow peaks, landscapes, gardens and nurseries. 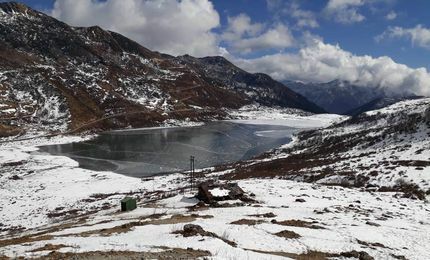 Namchi is about 78kms from Gangtok and takes about 3.5 hours by road. You can reach Zuluk, a small mountain hamlet in east Sikkim in about 4 hours from Gangtok. It falls on the historic Silk route that was once used for trading fur and wool with Tibet. You get breathtaking views of Kanchenjung, high altitude lakes, valleys and passes , and of course get to stay in comfortable homestays offered by villagers. Ravangla is for those who like to be away from the touristy crowd only to enjoy the nature, wonderful views of Kanchenjunga peaks and traditional hospitality of the locals. Ravangla is also a base for covering several other hill towns like Pelling, Namchi etc which are short distances away. Borong, another hamlet located close by and within 45 minutes of driving distance, is a jewel for birdwatching and soaking in the nature in a quiet environment. Visit Ravangla Tourism for details. Nature can not blend with mankind any further than what you experience in Dzongu... and why not? This is one place in north Sikkim which has been exclusively reserved for Lepchas who are the original inhabitants of Sikkim and who traditionally depend solely on the nature for living. Stunning views of Himalayan range including Kanchenjunga snow peaks, lovely landscapes with lush vegetation on the slopes of the hills, beautiful flowers, birds & butterflies, numerous waterfalls gushing down, mountain streams, scenic nature walks, fishing are all in the offer here along with village homestays where you can experience the local ethnic culture and savor the homemade Lepcha food and brews. If you are a nature lover, Read Dzongu Tourism to know all about it. Sikkim has opened it's own small airport in October 2018 known as Pakyong Airport. Domestic flights have started operating to this airport since then. Pakyong airport is located around 29kms from Gangtok and it takes about 1 hour 15 minutes to travel between the two places by taxi. However the main airport closest to Sikkim is Bagdogra Airport (IXB) which is located in Darjeeling district of West Bengal. There are numerous domestic flights (from almost all major cities of India) as well as limited International flights (mainly from Bhutan) that operate to this airport. So Bagdogra still remains as the main flight hub for tourists to visit Sikkim. From Bagdogra there are several ways to reach various parts of Sikkim. The most popular mode is by taxi - there is a pre-paid taxi counter at the Bagdogra arrival hall. Gangtok is 125kms from Bagdogra and it takes nearly 4 and half hours to reach. You can also book a shared taxi online to get to Gangtok from Bagdogra. There is also a daily Helicopter Service between Bagdogra airport and Gangtok. It takes only 35 minutes to reach the Burtuk Helipad at Gangtok. Having arrived at Bagdogra airport, if you want to avail bus service, you need to first take a taxi to the Sikkim Nationalised Transport (SNT) Bus Terminal in Siliguri (30 minutes) where you can get buses to Gangtok and several other places in Sikkim (described below). The major railway station nearest to Sikkim is New Jalpaiguri (NJP) in West Bengal (located only 18kms east of Bagdogra). NJP is connected to numerous destinations in India by long distance trains. From NJP too you can get pre-paid taxis as well as shared taxis to get to Sikkim. For bus, you can take an rickshaw or an auto-rickshaw to get to SNT Bus Terminal (takes 10 minutes by auto). From Siliguri SNT bus station, there are daily bus services to Gangtok. Read: How to reach Gangtok for details on routes, transports and fares to reach Gangtok. Siliguri to Pelling SNT bus leaves at 10:30am, Siliguri to Namchi bus (via Jorethang) leaves at 8am and 2:30pm, Siliguri to Ravangla (via Namchi) leaves at 1pm, and Siliguri to Mangan at 11am. Privateky operated Siliguri to Pakyong bus leaves at 2:30pm and Siliguri to Jorethang at 2pm. The road routes from both Bagdogra airport and NJP station pass through Siliguri of West Bengal and then lead to the highway NH10. Before leaving the busy traffic of lower plains, the road crosses over Teesta river at Teesta Bazaar area and then starts its uphill course through lovely vistas of river Teesta and lush mountains. It soon reaches a settlement known as Melli where a westward bifurcation of the road leads to South Sikkim (to places like Jorthang, Namchi, Ravangla etc and then to West Sikkim (to places like Pelling, Yuksum etc). Melli has a police check post that issues Inner Line Permits to foreigners to visit Sikkim. Pelling is about 5 hours 20 minutes from both Bagdogra and NJP by taxi. 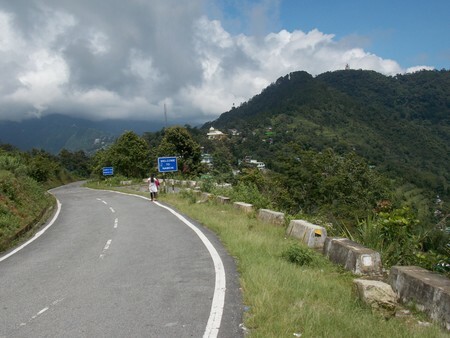 The main road NH10 continues through settlements like Rangpo (where there is a police check post issuing Inner Line Permits to foreigners), Singtam, Ranipool and all the way to Gangtok which is located in East Sikkim. From Gangtok you can visit various places in North Sikkim. Note that you can easily reach Gangtok from Darjeeling in about 4 hours by taxi. The best route is to take Peshoke road from Ghum/Jore Bungalow area down to Teesta Bazaar and get into NH10. There is another route from Darjeeling (can only be availed by Indians) that goes via Jamuni and leads to Jorthang in a short time (1 hour 40 minutes). From there you can easily approach Namchi, Ravangla etc in south Sikkim or Pelling, Yuksom etc in west Sikkim. The route map below shows the road routes to reach various parts of Sikkim. You might be aware that the time you are choosing for your visit is the monsoon time in Sikkim (June 15 to September 15), so I would advise you to consider Gangtok and nearby areas. Roads to several other places get affected due to rains and there are also chances of landslides. We are planning to travel to Sikkim around 20th June.... we have two kids age 7 and 4 ... How difficult it is to travel with them considering the long routes and bad roads...? And also the low oxygen levels at few places .. ? How do we manage with kids.... ? It would be really helpful if you could guide us... Thanks in advance. You can easily visit Gangtok and nearby places with your kids as well as south Sikkim (places like Namchi, Ravangla etc) and even west Sikkim (such as Pelling... road condition is bad though). All these places have adequate facilities and altitude won't be a concern. However you should avoid places like Tsomgo/Nathula and several places in north Sikkim such as Lachung/Yumthang, Lachen/ Gurudongmar lake etc because of high altitude where it is not recommended to take very young kids like yours. Nice to read all info of Sikkim tourism. I am planning to have tour for 10 days with Gangtok, Lahchung, Lahchen, Pelling, Darjeeling. It is possible to cover all these? Also is it advisable to book taxi plus hotel both in advance or only hotel and book taxi point to point after reaching there as journey advances? We are 4 adults and 1 child 6 year old. Bagdogra airport to Bagdogra return in Nov 2nd week. Please advice. Thanks. With 10 full days you can cover all the places you mentioned. You can take taxi transfers and tours when you reach Gangtok, Pelling and Darjeeling. You need not book in advance. However for Lachung & Lachen, contact one or two well-known Sikkim operators to plan out your trip (regular city taxis can not go there). I have toured almost all corners of India and hereafter I place Sikkim amongst the three best sites one should at least visit in their life. Sikkim is really a Jewell of the East/North East. The natural beauty in and around, cleanliness, honesty and simplicity of its people are highly remarkable. The unique thing which I noticed here is the vibrancy, hard work and omnipresence of its women power. The state with 100% organic food, plastic free and almost Zero % unemployment. Namchi, Ravangla are such a wonderful sights that spellbound you. Hi, usually heavy snowfall takes place around that time and roads get blocked. But one can be lucky too. Gurudongmar is likely to be inaccessible. Hi Raj, we will be traveling to Gangtok during October 3rd week and planning to visit Changu lake, Baba mandir and Nathula pass in a day. How long does it take to cover all three and can we travel all these places with 9 yr old? Thanks in advance. 9-year old usually should not be a problem. It's a full-day trip from Gangtok... you need to get your permits on the previous day. Hello, I just dropped by to say that this is the best website for anyone who is planning to visit Sikkim. You have managed to put every information possible which is really amazing. Kudos!! Thanks. Yes, you can take your private car to Darjeeling and Sikkim. However note that to travel to protected areas in Sikkim such as Tsomgo lake, Nathula, Yumthang etc, you need to get special permit for your vehicle from Sikkim Govt and army. Normally only vehicles from registered tour operators are permitted in such areas. February is one of the coldest months in Darjeeling & Sikkim and roads in north Sikkim (Lachung, Yumthang etc) can be blocked with snow. If open on a day, you can visit. However most of these places are protected areas and you need to go through a registered operator. You can try to combine with other groups, but in winter it can be difficult finding tourists. Sir, I only want to know if it is mandatory to book any tour package from Sikkim Tour operators to see the tourist places of Namchi and Rabangla, and any other South Sikkim destinations. It is because I have found out that to visit North, West and East Sikkim there are mandatory tour packages, and tourists themselves cannot book hotels and cars/cabs there. There is no such restriction. If you have a rental car with driver, you can move around and go anywhere (except to places that require Protected Area Permits). Only protected areas such as Nathula, Lachung/Yumthang etc require that you go through registered tour operators. Namchi, Rabangla do not fall in that category. I had been at NJP, Bagdogra, Gangtok, Lachung, Nathula Pass, Pelling and Darjeeling from 17th Nov to 27th Nov 2015. It is a fact that there is no state bus services between the places mentioned above, one has to travel by taxi. Though I traveled all my destination shown above by taxi, I am not able to get a certificate regarding the state bus services are not available in between the places shown above which is very required in claiming LTC to Govt. employees. If the same certificate is issued and published on website the tourists may increase and will encourage the tourism. So Sikkim Govt must think on this to encourage tourism. I am planning to visit Yumthang valley/Lachung in 2 days 1 night trip from Gangtok and Tsomgo lake and Baba mandir on other day in 1st week of March. I have my husband 2 years old son and 9 years old daughter. Please let me know if the road for these places will be open that time. Also for the kid what kind of precaution can be taken. I have heard of some small oxygen cylinder which is refundable if not used (with some charge). Is it available in Gangtok? End march and beginning of April is usually the time when roads to these places get cleared. But if you are lucky, the routes may remain open in 1st week of March as well. Portable oxygen cylinders are available at Gangtok. You can take your own private vehicle to Sikkim. However there are some restrictions for Nathula and North Sikkim. Usually vehicles from Sikkim government authorised operators are allowed in these areas. There are tour packages available from Gangtok. You can however take your own vehicle, but for that you need to obtain Sikkim police and army permits, vehicle fitness certificate from permit issuing authority, and also take a local guide along from Gangtok who will be your navigator. Your vehicle should be an SUV or 4WD vehicle to negotiate the bad roads. While Nathula road is not good, the road to Lachung and Yumthang is terrible. Permit cost is reasonable. For example permit to Nathula costs Rs. 200/- per person. October is a good time to visit Sikkim.